It is a mixture of essential oils of Spruce, Ho Wood, Frankincense, Blue Tansy, and Blue Chamomile with Fractionated Coconut Oil. SPRUCE: Balancing our ability to give and receive. The herbal scent helps to extend the bronchi to deepen breathing and relieve tension or emotional blockages that can reside in the throat, jaw, and chest. HO WOOD: slowly takes over the place of rosewood, as it is becoming threatened and, therefore, good companies decide not to use this essential oil. At Ho wood, the chemical composition is very similar to that of rosé wood, it is a strong sedative that has calming effects on the nervous system and emotions. FRANKINCENSE: This oil has been used for centuries for physical and emotional healing. It contains sesquiterpenes, which act on the epiphysis and pituitary gland, and these glands promote the better health of our brains. It strengthens the skin and nails and stimulates cell regeneration, thereby convincing ageing. It also balances mood and strengthens the human spiritual connection and sense of understanding. I already wrote more about this oil in the group. BLUE TANSY: This oil helps us to detoxify the liver and lymphatic system, which is closely related to the anger and depression. However, the connection with the mind allows for more self-control and well-being. BLUE CHAMOMILE: calming and sedative oil, its extremely good characteristic is to relieve pain and relieve stress. 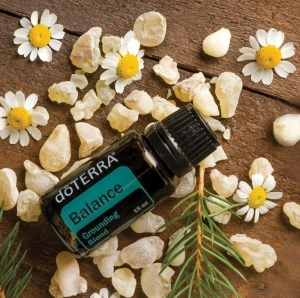 WHAT CAN YOU USE A MIXTURE OF ETHICAL OIL BALANCE? - Start your day by applying a mixture of Balance essential oil on your feet, as this will reduce stress throughout the day. You can also do this to children before taking them to a nursery or going to school. - use it before a stressful meeting with your superior or demanding client, as it will suit you nicely and calmls you down. Rule 1: Less is More! Are you interested in more? Contact me! Essential oils are not medicines, and as a user, I can only advise on the basis of their experience and the experience of others who have helped with any problems with essential oils. I do not put a diagnosis or prescribe medication. I am not responsible for the possible consequences of improper use.